Over the last few years my working life has changed totally. For over 10 years I was a travel agent at the "Tasmanian Travel Centre" in Collins St, Melbourne until the Tasmanian Government closed us down. It was a very stressful time as I really loved my job. My future had all of a sudden become so uncertain. Most people don't work somewhere and actually love their job. I was lucky enough to be approached by a travel wholesaler "Groups Tasmania" to offer me the position of being their "Victorian Sales Manager". I accepted and have now worked with David, Brett, Wendy and Garry for just over 2 years. It is a great job and a great company to work for. One of my duties is to meet with various people in the travel industry and basically try and get their business. 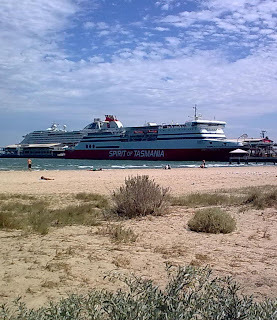 Today was sort of one of those days and I had lunch with a few girls from the "Spirit of Tasmania" . We went down to St. Kilda and had Tapas at a restaurant called "Pelican". The food was really delicious especially the Moreton Bay Bugs. It was so nice down there not to busy and not to hot. There were people relaxing on the beach, walking along the esplanade and busily working. I just love "people watching". I gaze and wonder are they happy in their life, where are they going, where are the from??? It is very relaxing just sitting and looking at people just being. Tomorrow we are once again in for a hot one 43c !!!!! I think I might sit in my airconditioned room and do a few scrapbooking pages - maybe even drink the bottle of Riccadonna in the fridge. "We Can Help and Also Feel Good"
What is going on with the weather!!! Why "53 Buddhas and Me"? ?